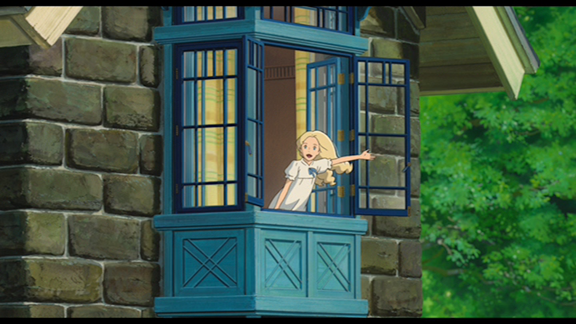 Please Note: The screen shots used here are taken from the DVD portion of When Marnie Was There. 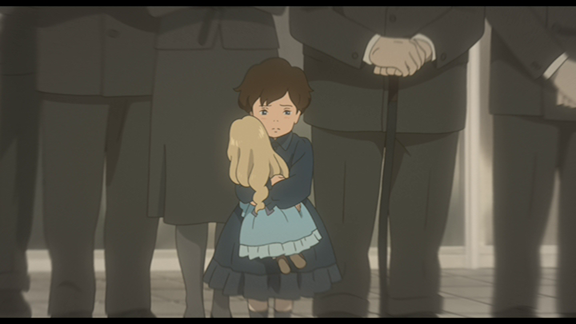 The animation giants at Studio Ghibli bowed out in a surprisingly subtle way with the charming friendship tale When Marnie Was There. Thoughtfully directed by Hiromasa Yonebayashi (The Secret World of Arrietty), this sweet story is solidly Ghibli-like, with fully fleshed-out characters in a gorgeously rendered, earthbound yet magical setting. The movie offers up the kind of classy, non-patronizing stuff that Ghibli fans expect, suffused with enough different flair to make one wistful for what's likely to be the studio's final feature. At heart, When Marnie Was There deals with the friendship that develops between two young girls - one's an introvert trying to make sense of her place in a cruel world, while the other is a free, generous spirit. Voiced on the film's English soundtrack by Hailee Steinfeld, Anna Sasaki is portrayed as a bright, talented twelve year-old who nevertheless fails to relate with anyone else - not her gossipy classmates, not even her concerned adoptive mother (Geena Davis). After the withdrawn, self-loathing kid becomes physically ill, the mother decides to send Anna off to recuperate at a marshy, rural enclave where the girl's jovial uncle (John C. Reilly) and aunt (Grey Griffin) live. Although Anna's relatives offer her lots of freedom and the lovely weather improves her asthma, the girl still has a nagging restlessness - until she becomes drawn to an old, Western-style mansion built overlooking the bay. Venturing over to the house, she finds an ethereal blonde girl wearing an old-fashioned dress - Marnie (Kiernan Shipka) - who breaks through Anna's reserved shell with her spirited thirst for adventure. As the story unfolds, Anna becomes aware of odd things about Marnie, such as how she can't go out at certain times and has limited mobility. One day, she notices that Marnie's home has been renovated. With the help of Sayaka (Ave Acres), a girl now living in Marnie's home, Anna finds out that her intense connection with Marnie goes deeper than she ever realized. Along the way, Anna has an emotional reunion with Marnie, while the random things seen in the seaside community - a mute oarsman, a wizened artist, and creepy abandoned silo on a nearby hilltop - become crystal clear to Anna. 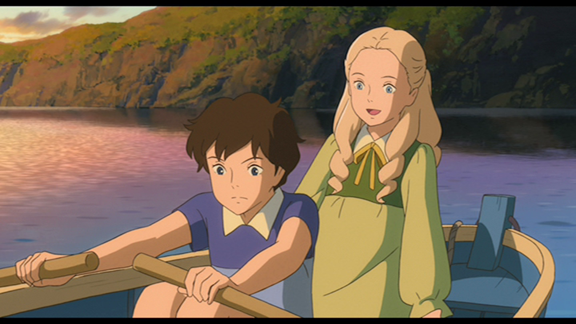 Although it was adapted from a British novel published in 1967, When Marnie Was There traffics in a lot of the same themes present in current shojo anime and manga aimed at girls - a romantic yearning for times long ago, and the idea that two seemingly different people are destined to come together through fate. While some might find the first half of this movie irritating - scene after scene demonstrating that Anna is basically a passive wimp - a huge payoff comes with the arrival of ethereal Marnie and her calming presence. It goes without saying that the animation is breathtaking, its dreamy atmosphere complemented by the lyrical musical score, which handily makes up for the story's shortcomings. Despite an ending that can be telegraphed from a mile away, the emotional interplay between Marnie and Anna has a surprisingly potent, lump-in-your-throat poignance. What makes Marnie different - even amongst Ghibli's exalted output - lies in having a strong-willed introvert as the main character. While Hollywood is content with making sure that its few young-girl lead characters are molded from a generically sassy blueprint (I'm thinking specifically of the girl from DreamWorks' Home, but any number of other movies - animated and not - would apply), Anna in this film emerges as a notably unique creation. She holds up well alongside the other willful girl characters in Ghibli's stable, yet Anna's introverted personality fills a gap - a gap which many kids (and adults) could readily identify with. As a confirmed introvert, I approve. Universal's multi-format home video release of When Marnie Was There houses a Blu-ray and DVD disc in a standard Blu-sized snap case with paperboard sleeve. 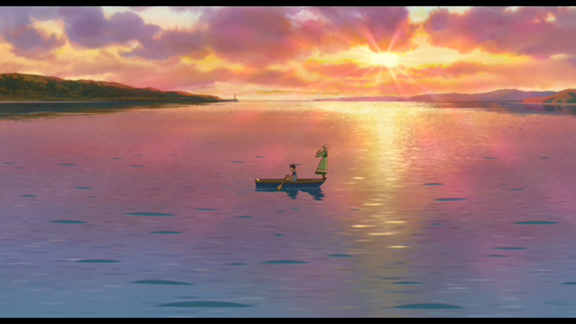 As with the other Studio Ghibli titles, When Marnie Was There ends up looking beautiful in 1.85:1 widescreen. The 1080p high-def image shimmers with clarity and solid, wonderfully saturated color - even the nighttime scenes have a luminosity and depth. 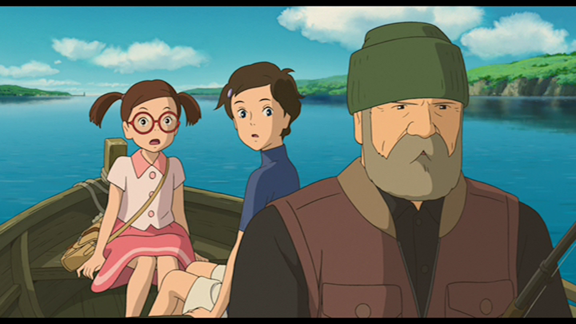 Somehow, the transfers on many of these Ghibli films end up having pixelization issues on the fine edges in the animated drawings, yet this particular one basically has a nice, organic feel with crisp (not jaggedy) edge enhancement. The film's original Japanese-language soundtrack is presented in a solid DTS-HD 5.0 Surround mix, an atmospheric track which keeps the dialogue in the central channel while judiciously using sound effects in the left and right channels. The mixing is especially effective during a storm scene with rain and thunder adding to the scene's oppressiveness. While the default option on this disc is the same 5.0 mix with the English-language dub, the disc also provides a French-language dub. Optional subtitles are provided in English, French and English SDH (for the English dub). Universal has included one newly-produced feature for their edition of When Marnie Was There, along with a few fascinating behind-the-scenes pieces originally made for Japanese television. As with other Studio Ghibli features on Blu-ray, it also includes the option of watching the film with storyboard stills instead of the final animation. Behind the Scenes with the Voice Cast (12:39) Hailee Steinfeld, Kiernan Shipka, Geena Davis, John C. Reilly, Kathy Bates and other actors hired for the English-language soundtrack discuss the challenges and pleasures of recording their parts. The Making of When Marnie Was There (42:38); Blu-ray only) Made for Nippon TV in Japan, this busy, breathless feature outlines the production and release of the movie. Director Hiromasa Yonebayashi talks about the pressure of working for Studio Ghibli, then travels to the actual locale that inspired Marnie's marshy setting with Japanese actress Sara Takatsuki (the original voice of Anna). 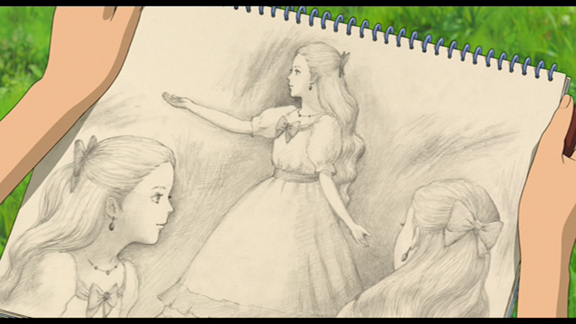 Yohei Taneda Creates the Art of When Marnie Was There (17:14); Blu-ray only) Narrated in Japanese with English subtitles, this is an immersive walk-through of a gallery exhibit devoted to Marnie art on display in Japan during the summer of 2014. In addition to the film's production art, the exhibit also included intricate dioramas of scenes from the movie and a life-sized replica of Marnie's bedroom. The Blu-ray sports a Feature-Length Storyboards viewing option, with edited-together stills playing over the film's soundtrack. A selection of Foreign Trailers and TV Spots (6:21) and the U.S. Trailer (1:39) round out the extras. The gentle, earnest When Marnie Was There follows two young girls whose connection goes deeper than either realize, an unexpectedly intimate affair that closes out Studio Ghibli in high style. The movie arrives on Blu-ray with its stunning visuals intact, of course - the story may be predictable, yet I defy anyone to watch and not get choked-up a little. It's a bittersweet sayonara to this animation icon. Highly Recommended.